Enjoy a 2 night stay for 2 guests in a Tibetan Farmhouse at the stunning Banyan Tree Ringha in Jian Tang Town Shangrila County Diqing, Yunnan. Stay includes: daily breakfast, return airport transfers from Shangri-La Diqinq Airport and welcome drinks for 2. Stay is valued at approximately $588 USD / £460 GBP*. Please note all additional purchases including meals, drinks, spa treatments, excursions etc. must be paid for by the winner separately. Auction stay dates: to be booked in advance and taken between 01 March to 30 November 2019, excluding bookings over all Chinese Public holidays and between 15 July to 15 Aug 2019, subject to availability. Discover your Shangrila at the stunning Banyan Tree Ringha in Yunnan. Nestled in the beautiful Shangrila highlands in Tibet, surrounded by the stunning beauty of the Himalayas, the resort is one of the most secluded hideaways in the world. Guests are touched by the ancient land and the majestic mountains that surround it. Built from traditional Tibetan farmhouses, the resort itself is a picturesque experience that allows you to relax, unwind and find the inner peace you desire. At the Banyan Tree Ringha, you are invited to immerse yourself in the vibrant colours of the glorious Shangri-La. 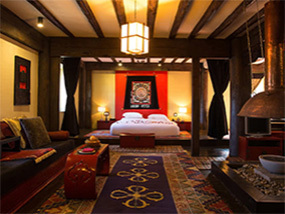 The property features the luxury Banyan Tree Spa Ringha where treatments are inspired by local Tibetan beliefs; beautiful meeting rooms; the opportunity to go on Tibetan treks and tours embracing the spirituality and soul of the area, or why not bring home little touches of local handicrafts and more from the Banyan Tree Gallery. In terms of dining, guests can experience real Tibetan food traditions with 4 different dining options at the hotel. The Chang Sa Bar & Restaurant offers authentic local Tibetan flavours; the casual Llamo Restaurant offers delicious local and international cuisine; the Jakhang Lobby Lounge offers teas, coffees and snacks surrounded by a roaring fireplace; and finally, for something a little special: Destination Dining in beautiful Mongolian Yurts is available with authentic Tibetan cuisine. The winner and their guest will be staying in a charming 175 sqm. Tibetan farmhouse with stunning views to the forest, the river and the mountains. The two level house includes a separate bedroom with stone steps. Immerse yourself in the handcrafted wooden bath and enjoy the rustic feel of Shangrila. Amenities include: a king or queen bed, flatscreen TV, CD & DVD player, mini bar, coffee and tea making facilities, oil burner and incense stick, safe, indoor and outdoor shower with bathrobes, slippers and toiletries. Luxury Travel Diary terms and conditions apply. *This auction item is valued at approximately $588 USD by Banyan Tree Ringha, Hong Po Village, Jian Tang Town Shangrila County Diqing Tibetan Autonomous Prefecture Yunnan Province P. R. China 674400 – please note this valuation is the list price provided to Luxury Travel Diary by the Auction Prize Provider and should be used as a guide only as cheaper discounted rates may be available. No cash alternative is available. This auction item excludes flights and transport – you will need to arrange your own flights / transportation to and from your home to Banyan Tree Ringha, Hong Po Village, Jian Tang Town Shangrila County Diqing Tibetan Autonomous Prefecture Yunnan Province P. R. China 674400 to coincide with your booking. Your stay is subject to availability, must be booked in advance and taken between 01 March to 30 November 2019, excluding bookings over all Chinese Public holidays and between 15 July to 15 Aug 2019. Please note any associated taxes / resort fees / entrance fees etc. and all additional purchases will be collected from the winner by the relevant property at the time of booking your stay or on departure and will not be deducted from the amount bid for the item. Winners must pay for their auction item in full via PayPal within 48 hours of the auction end. The full Terms of our auctions can be found here. To the fullest extent permitted by law, Luxury Travel Diary will not be liable for any loss or damage arising out of the winners’ use or enjoyment of the prize; and the winner acknowledges that Luxury Travel Diary accepts no responsibility whether directly or indirectly for any claims whatsoever arising in respect of the prizes provided by third party providers or sponsors.